U.S. Secretary of the Treasury Steven Mnuchin waits for U.S. President Donald Trump to speak about tax reform in Harrisburg, Pennsylvania, U.S., October 11, 2017. WASHINGTON - U.S. Treasury Secretary Steven Mnuchin said on Friday that it was difficult for the Trump administration’s tax plan not to cut taxes for the wealthiest earners. “If you’re cutting taxes, it is hard to create a system where you’re not going to also cut taxes on the top 10 percent,” Mnuchin said at an Institute for International Finance event in Washington on the sidelines of the IMF and World Bank semi-annual meetings. “I’d also say that 10 percent invests a lot of money so what we’re trying to do is not create disproportionate tax cuts to the top,” he added. 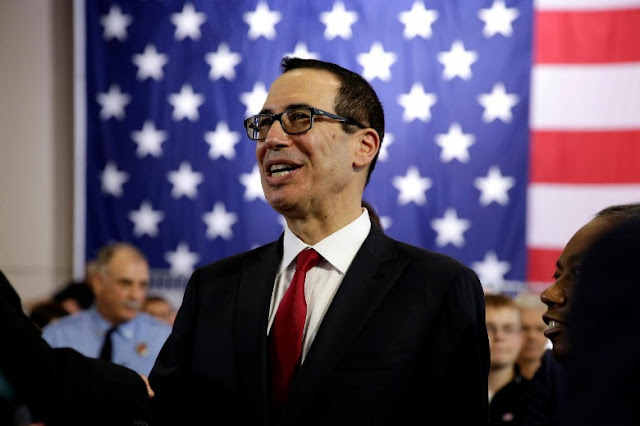 U.S. Treasury Secretary Steven Mnuchin said on Friday that it was difficult for the Trump administration’s tax plan not to cut taxes for the wealthiest earners.